In the preface to his Four Lectures, Stephen Rodefer famously wrote: “Today we have painted cities, painted conveyances, painted apartments, painted roads, painted people, even painted food. Is it not time for painted poetry as well?” This question has found a highly receptive addressee in Ian Heames, a poet who has published a set of extensive annotations to Rodefer’s poem, and one whose own poetry might itself be thought to evoke or suggest the art of painting. Heames’ ‘painted poetry’ is often prefigured by the production values of his self-released Face Press chapbooks, the artwork to which typically seems to aspire towards a similarly extrinsic condition to that of the poetry. Stated more specifically, even though Heames’ book designs don’t actually incorporate traditional paintings, they are nonetheless highly ekphrastic nods to the form (vide the floral intaglio of Out of Villon, the abstract digital pointillism of Arrays, or the Rothko-ized photography of Banners Over Terminal Highway). As regards the poetry itself, Heames’ style of ‘painting’ has already passed through several iterations, from the euphonious impasto of his earlier work, to the variegated motif-stippling of his ongoing Sonnets series. 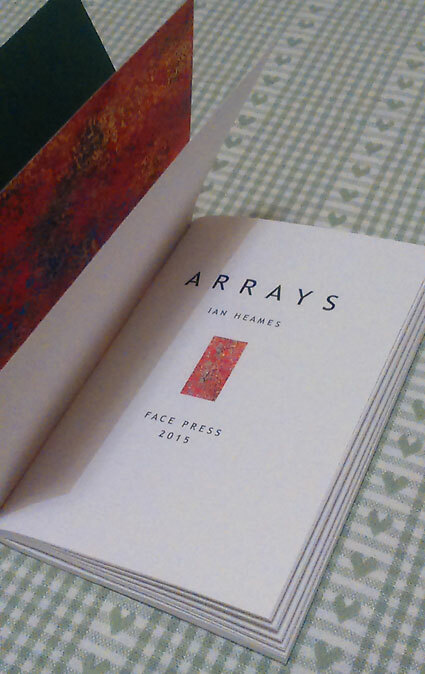 The 2015 chapbook Arrays – which collects the releases Array One (Critical Documents, 2012), To (Iodine, 2013), and A.I In Daylight (Materials, 2014) – is an especially interesting juncture of Heames’ painterly development, and one that is worthy of a close reading on its own terms. For Rodefer, as for Heames, poetic painting aims not at a neat, skillful prosopopeia, but rather at a series of effacements and refasionings, with the aim of allowing all pentimenti to peer out from behind the redacted text. Indeed, “jarring color and juxtaposition” perhaps doesn’t go far enough in Heames’ case; for in Arrays, what we more often see is impossible colour and juxtaposition: “the night turns one quarter green / incarnadine”. One could perhaps write an entire essay on this string of text alone. Striking us at first as a mere tremor, a local wavelet of protean colour, “green / incarnadine” can turn, if we allow it to, into a whelm of poetry so oppressive that it threatens to arrest the hermeneutic urge. Knowing that we cannot arrive at the wavelength “green / incarnadine” through the dictionary, the Pantone Matching system, or any other readily available reference work, we may prefer to dispense with any attempt to arrive at it at all—to which end we might be thankful for the line break, see it as a welcome bulwark against so oppressive an incongruity. However, this requires that we overlook its lacerative suggestion, its subtle nod to the sanguinary associations that have attended the word “incarnadine” ever since its appearance in Shakespeare’s Macbeth. Such suggestiveness is also, by extension, a reminder that Shakespeare (or his readers) had already taken a scalpel to the entailed flesh of the word’s etymology long before its appearance in Arrays, irrevocably staining the word just as Macbeth would stain the “multitudinous seas”. We are thus confronted with a mysterious new wound atop an old one—mysterious because it precedes the cutaneous integration that it severs. Given that there has never been any ‘greenincarnadine’ to speak of, Heames’ amputation acts as a displaced emotional stimulus, triggering in the reader an urge to mourn something that has never been cathected. The discomforting vagueness of this violence is further complicated by the fact that, before its severance, “green / incarnadine” had already been chromatically quartered (more blood, perhaps), and was thus already an etiolated version of its Platonic form. Any attempt here to “storm the exactest shade”, to restore a pure ‘greenincarnadine’, would thus occur outside the frame of textual signification. One could certainly write at far greater length about the swirling Ishihara plate of colours in Arrays; however, there are also other striking impossibilities in the text that are equally worthy of our attention. Nowhere, perhaps, are such impossibilities more apparent than in the monsters of Arrays. Heames’ teratology is extreme, transcending more familiar zoomorphic configurations, and extending even to the moment of utterance itself, so that not only do the referents become monstrous, but the signifying apparatus does, too (e.g. “Swans into theatregoer in floods”; “that visibly pet moth”; “Cherry-pick workplace murex vernix Euler tour / then evolved into prey”). Most notable, perhaps, is the progressive interlocking of several wildly different taxonomies. In one prominent example, the lepidopterous and the cetaceous drift into an improbable congress, out of which emerges a “moth dolphin” (elsewhere a “beached moth”). But this impossible miscegenation is not nearly impossible enough, given that the site of its unfolding is purely biological. What Arrays seems ultimately to strive for is a monstrosity that implies more than merely organic impossibility, a monstrosity that sublates chemistry, warfare, art, and myriad systems of knowledge or inscription. Thus, we also encounter a “metalloid cartouche butterfly” and a “military dolphin”. Heames elaborates on the latter thus: “A military dolphin is a dolphin / Trained for military uses / / One in three warplanes / Learn cuneiform”. Given the proximity of “dolphin” to “warplanes”, I’m inclined to read beyond the text here, and to posit “moths that desire fins” as being almost fungible with an extra-textual ‘dolphins that desire wings’. If such fast-and-loose reading seems dubious, I hope that the point extractable from it – namely, that a desire for wings doesn’t necessarily, or even likely imply biological alation (far less romantic or poetic elation) – is nonetheless relevant to the broader concerns of Arrays. What we see in the “metalloid cartouche butterfly”, as in the [cetacean?] “warplanes that learn cuneiform”, is a startling triad of nature, techne, and inscription—that is to say, a gesture towards mastery and deployment (with all of the various connotations that those two words might be thought to evoke). This bores right into the etymology of the title. In its oldest attestations, ‘array’ is a martial word (the OED defines the verb thus: “To set or place in order of readiness, to marshall. esp. To draw up prepared for battle”; and the noun thus: “Arrangement in line or ranks, esp. martial order”). Over time, the word has bled into various other disciplines – mathematics, statistics, computing, law, etc. – on top of being co-opted for the inevitable figurative usages. This ‘bleeding’ is essential to Arrays, is part of the book’s linguistic and philosophical ‘sfumato’ (a term Heames actually uses once in the collection: “in sfumato limelight”). If the general use of sfumato might sometimes achieve the expected shades (“Borders with no guard left”) it is also often a technique of willful obnubilation, of a kind that might invite charges of vagueness or misdirection (“please cloud / my judgement”). What Heames often chooses to deploy is perhaps precisely the kind of material that he might be expected by some to elide. Consider the use of trees, for example. If Brecht’s claim that “talking about trees is almost a crime / because it avoids speaking about so many brutalities” might still be thought relevant for contemporary poetry, it is one to which Heames is demonstrably unable to subscribe: “trees like the trees of another world”; “some tree lined Valhalla of the crestfallen”; “trees locks / seas curls”; “moth tree to moth”. That which, for Brecht, is almost impossible for committed poetry, is, for Heames, clearly not impossible enough. Whether this makes the deployment of trees in his work more, or less worthy of censure is uncertain. But either way, far from being merely the pretty staffage of a painted poetry, these trees are – like most phenomena in Arrays – worked into important discursive and hypertextual knots. The first quote (enriched by the ambiguity of the word “like”) compresses poetry, ecology, psychology, gender, cosmology, politics, sociology, and social media into its few words. This perhaps seems a bold claim at face value. But at the very least, we must recognize that it is difficult to discern any ‘simple’ tree in Arrays. The word ‘tree’ is too historically charged, too laden with associations (poetic staple/bauble; life-giver; phallus; etc.) that are not – or are not necessarily – compatible with each other. As a further rebuttal to this simplicity, the trees of Arrays also act like synapses that effect pro- and analeptic communication with other, intratextual phenomena. Thus, “some tree lined Valhalla of the crestfallen” refers us forward (if we are willing to shoehorn in a contraband etymology) to “trees locks / seas curls”, which in turn refers us forward to “locks greener [parenthetically, a hypertextual link to all of the various ‘greens’ of Arrays] and more weeping”, which in turn refers us back to “use iris to melt locks”, which – on top of becoming reciprocally (and recursively) referential with “locks greener” – seems to radiate out towards all of the impossible colours of Arrays. The horrendously pleached syntax generated by the parentheses in the above sentence should go some way to conveying the dense, proliferative effects of Heames’ text. One could just as easily abstract the words “world”, “lined”, “seas”, or “moth” from the above quotes, and go off on other tangents. Thus we are confronted not only with a kind of hyper-economy or- compression (a desire, in other words, to deploy individual words with a largesse that maximally confounds the notion of simple conveyance), but also with proliferating in-text matrices that both deepen and complicate this economy. Consider, for example, the line: “Autumn Psyche Nightingale Indolence Autumn”. Divorced from the context of literary history, these words would be, at best, merely rich; but realizing that the words need not – in any definitional or categorical sense – concatenate naturally with each other, we might have pause thereby to be startled by the very specific associative power that they exact. If we ‘know’ what Heames has done – namely, that he has compressed Keats’ classic odes by the simple juxtaposition of their titular keywords – we also know that such knowledge is not intrinsic to the words themselves (a fact that holds true even as they are deployed alongside each other). It’s an impressive card trick; and yet, however arresting it might be in the moment, Heames’ uploading of a secret, exformational cache of entire poems (via a simple list of nouns, no less) is ultimately unsatisfying. What appears at first to be a type of hyper-compression soon becomes a verbal cincture that must be unloosened. It is not enough that these nouns refer only to Keats odes. The storm that passes through Arrays (and by storm, I refer both to an actual, narrative storm, and to an unremitting and oragious attack on language) ensures that almost any given word in the book isn’t quite what it is. Writes Heames: “the shakeup could proceed / as early as this autumn”. This sentence, which, like so many in Arrays, reads like found language, becomes more than what it appears, is ionized by the context of its placement, so that “this autumn” is also that “Autumn”—i.e. Keats’ Autumn, shaken up or out by the storm. But lest these cross-textual mappings belie the more afferent or self-contained effects of the poetry, it is perhaps worth pausing for a close reading of a single poem. The poem ‘1.1.3’ from ‘A.I. In Daylight’ is reproduced in its entirety below. Notwithstanding the pageant of monsters already encountered in Arrays, the rapid-fire stacking of “crab panther Dis regent emanation clown / flame troubadour tsar manta” seems almost too excessive, larded beyond leitmotif to the point of poetic infarction. The initial urge is to treat this monster as reflexive hyper-parody, and thus to dismiss its constituent words as a kind of protruding surplusage—i.e. as noticeable, but unimportant beyond the moment of lurid self-flagellation. But there is something going on in this weird mess of words that allows the monster to reclaim its troubled corpus beyond the parody, to feel itself as the site of its own conflict. This conflict is felt not only in the fraught conjunction of the body’s social, biological, and physical constituents, but also in the stratification that these can imply, in their historical or futural status as signifiers of power or pathos, and in the flickering grammar by which they vie to be read substantively. The crab panther is thus simultaneously a hideous monster and a conspicuously monstrous body politic. The monster is also a harbinger of the fraught syntagms that will follow. In the second (micro-) stanza, we encounter “sort of floats”, a phrase almost calligramic in the buoyancy of its placement above the third stanza. That which “sort of floats / in on the receding undertow” also doesn’t do so, denies the water as facilitative body, hardens into a complicit noun that is “in on” the whole thing, or which simply hovers above, safely static (however tantalizing), before giving way to, or becoming subsumed in another monster: “cadre made halcyon phoenix of my ovation”. Rather than immediately dovetailing with “[…] receding undertow”, this line reads as a kind of Frankensteinian suture, a grammatical oddment that requires a certain level of readerly pressure – etymological, phonological, and morphological – before the various operations of the juxtaposition become less opaque. Most obviously, perhaps, “halcyon” at least lends the aquatic buoyancy the context of myth—although the avian surfeit of “phoenix” cancels (nixes) this elemental mooring with its associative fire. Both “halcycon” and “phoenix” are also suggestively chromatic, the former orthographically evoking ‘cyan’, the latter derived etymologically from “purple-red, crimson”. By the time we reach “ovation” – a brilliantly germane choice of word – the line has become almost untenable in its multiparous generosity, flailing around to keep hold of its offspring. “Ovation” is almost ‘aviation’, evoking by this similarity halcyon/phoenician flight and generation, tinged all the while (via “cadre”) with the suggestion of soldiers and warplanes. Soldiers – or their sublimation as athletes – are of course themselves entailed by the word “ovation”. Thus, the halcyon that would build its nest atop calm waters is threatened, trapped inside a syntagm that seems designed to thwart the simple nesting instinct, and to promote instead a kind of oviparous surfeit. In truth, though, “syntagm” doesn’t seem quite accurate; for the matrix out of which meaning is (however dubiously) ‘held’, feels less linear, more densely patinaed than whatever might be possible purely at the level of the sentence. The word “cadre”, for example, can be linked (via its etymological roots as “four-sided thing, square”) to “mesh”. Both “cadre” and “mesh” entail, in various ways, “border” and “list”, and all four words variously imply capture or containment. But this lunge to containment is always compromised by border spillage. The word “list”, in particular, yields copious etymological spoils. That which is “listed as vulnerable” is the building that ‘leans’, ‘inclines’, or (in light of the already established oceanic setting) ‘careens’. It is ‘bordered’, or ‘taken pleasure in’. But it is also ‘listened to’. Such definitional richness affects the lines in strange ways. The phrase “looks pleasing” begins to seem almost uncannily tautologous in the context of listly ‘pleasure’, while “sad playlist”, given a super-aural definition, reveals itself as the false cognate we probably never knew existed. It is doubtful whether any of this ‘comes to rest’ in hermeneutic fixity or inertia. The penultimate stanza parlays the dubiety, so that the “doubt” proffered by a “pretend leader” is amplified by the de-humanizing pronoun “it”. We have one more stanza to try to draw out further associations, and might perhaps start by positing “peach” and “willow” as problem colours generically similar to “halcyon” and “phoenix”. But when it comes to arriving at a definitive answer, “it would be easier to hold games” (Olympic, video, or language). That is to say, it would and it wouldn’t be easier, depending on which kind of prehensility we are taking about at any given moment of reading—if indeed we can hold anything for long enough to know exactly what it is we are talking about. And yet, for all of this, there are rare occasions elsewhere in the book when Heames chisels out a seemingly crystalline apophthegm. “Love is an abuse of love” echoes a similar line in Rodefer’s Four Lectures—“Ordinary human love can RUIN a being for the experience of real love”. Regardless of any homage that may or may not be at play in Heames’ line, its sentiment is as succinct a crystallization of a particularly prevalent tenor of avant-garde poetic ‘love’ as any I have encountered in contemporary British poetry. Vigilant yet fragile, it cannot quite sustain itself (or can do so only vexedly under the weight of its paradox). Another string of text makes similarly tantalizing apophthegmatic demands: “love, as in politics / before the city / gets made there”. The grammar here appears tensile and generative, but is in fact isotropically weak. There can be no restitution – for love, for politics, or for the city – however vividly the nouns might emerge from the lines, or however ardently they might suggest that they are imbricated, temporally moored, made/decided/perfected/instantiated. The words thus run a kind of gamut of semantic clarity and nonsense, comprising at first a trenchant apophthegm, which then fractures under scrutiny into rich equivocation, and finally resolves into a carefully crafted series of conjunctive repeals. This is a poetry, then, not only of what gets included (trees, for example), but also of what gets excluded or denied. Specifically, it is a poetry that seems to wonder at the viability of certain strands of ‘left’ thought in contemporary avant-garde poetics. The final couplet of the collection reads: “Left poetry to lift weights / Air between wings again”. Here, Heames’ fondness for puns (prevalent throughout Arrays) can be seen at its most strikingly polysemic. “Left poetry to lift weights” works simultaneously as a defection, a commitment, an admonishment, a promise, and an arrogation, while “Air between wings again” is both a re-subliming into a now long-embargoed poetic flight, and an attempt to purify the stagnant – or perhaps even the noxious – odour that has built up under the complacency of certain contemporary pretensions. Brilliant work, we might think, and hardly open to castigation simply because it works an array of volte-faces into its more dutiful moments. And yet, at a time when a great number of the poets in Heames’ broader milieu often invoke direct targets and rhetorics – and do so in ways that suggest figurative mobilization, deployment, and attack – Heames stands out in his preference for a more iridescent, or better yet, a more spectral semantic palette. Granted, there are tissues of what might be called a more direct poetic idiolect in Arrays (“teens woke from a heavily policed summer”; “caught up in the rhetoric of the Games”; etc. ), but the book never comes close to positioning Heames alongside the more brazen of his contemporaries. Indeed, his question “Why should I even mention / These politicians” might almost seem incendiary, an unwelcome fit of malcontent. But certainly, it provides an invigorating challenge to the notion that any committed poetics must treat certain material as essential, just as it treats other material as verboten. If not a directly political text, Arrays is nonetheless a fascinating and challenging wunderkammer, a collection of monsters from the imagined intersections of politics, technology, war, video games, the internet, social media, dreams, and nature, and one that arouses in us a suspicion that simply reading these words (or simply reading these words [or simply reading these words]) will risk eliding too much. We are thus kindled with a desire to read also what has been painted over or scratched out. An apparent piece of found language (which we might do well to imagine as having been both deployed verbatim and painted over) brings us quickly to the point: “Some names have been changed”. Indeed they have.